Knocklaur is roughly the midpoint on the ridge connecting Maumtrasna and Devilsmother. This explains its name, Knocklaur, meaning ‘middle hill’. 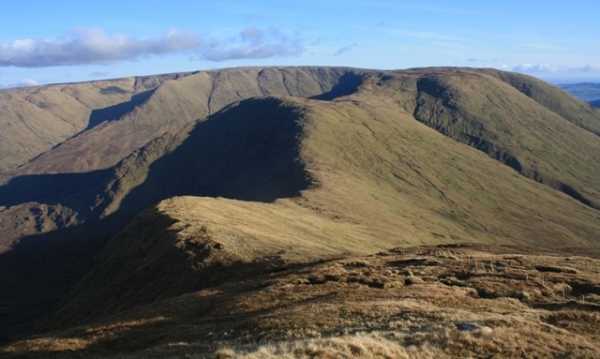 The ridge itself has extremely steep drops along its northern side, while the southern side of the ridge is gentler. It is easy to keep well away from the steep northern drops as the ridge is quite broad. While Knocklaur can be climbed directly from the south, it is more likely to be climbed either from the Devilsmother ridge or from Maumtrasna. The views from Knocklaur are fantastic, especially across to the ridge containing Devilsmother and Devilsmother North Top to the west, and the vast bulk of Maumtrasna to the east. Knocklaur has a large spur that juts out into the Glennacally valley, although the severity of the gradient on this spur would prevent access to Knocklaur this way for all but the most experienced summiteers. Those on a long walk can start from L935 655 C, where there is room to park a couple of cars beside a bridge. A local sheep farmer said access to the valley from here is permitted. From here cross the river and follow a fence into the valley for several hundred metres before heading directly up the steep wet slopes to gain the Devilsmother ridge. The ridge is wide and heathery, and can be followed to L920 630 A where it connects to the ridge to Knocklaur and Maumtrasna. The final haul up to Knocklaur is quite steep, although a handy fence can provide support. If including the two Devilsmother tops first, Knocklaur can be reached in about three hours.